Judy O'Connor and her son, Marty, were honored by Chapman University. A mother who attended every class with her quadriplegic son so he could pursue his Master of Business Administration (MBA) was surprised with her own honorary degree at her son’s graduation. Judy O’Connor, a retired elementary school teacher, relocated from Florida to California in 2013 to care for her son, Marty O’Connor, who was paralyzed a year earlier after falling down a flight of stairs. Marty O’Connor was a former competitive athlete who had a promising career in sales at the time of his accident. After spending nearly two years focused on his physical recovery, Marty O’Connor said he was ready for a new challenge. When Marty O’Connor decided to pursue an MBA degree at Chapman University, in Orange, California, his mom was right by his side. 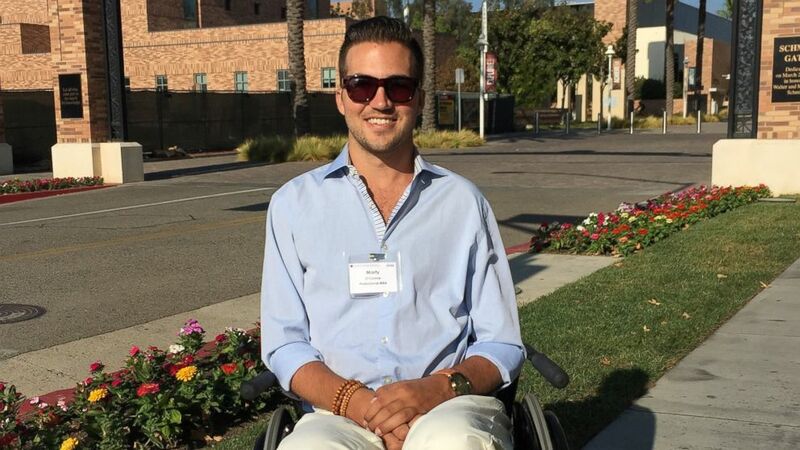 (Courtesy Judy O'Connor) Marty O'Connor, 29, received his MBA from Chapman University. Judy O’Connor attended every class, tutoring session, group study session and more with her son over the course of his two-year MBA program. When Marty O’Connor had a question in class, it was his mother who raised her hand for him. Judy O’Connor also took notes and wrote test answers for her son, who uses an iPad, laptop, voice recognition software and a mouth stick to communicate. Judy O’Connor said she watched a “total transformation” of her son as he redefined his future through his education. Marty O’Connor excelled in the MBA program, making it into the Beta Gamma Sigma honor society and receiving the business school’s nomination for Chapman’s outstanding graduate student award. While being recognized for his accomplishments earlier this year, Marty O’Connor had the chance to meet with Chapman University president Daniele Struppa. During that meeting, he made a formal nomination for his mom to receive an honorary MBA. After months of planning in secret with school officials, Marty O’Connor watched as his mom was surprised at his graduation last Saturday. O’Connor stood behind her son’s wheelchair until a school official pulled her to the front and handed her an honorary degree. The graduation announcer choked up while describing why O'Connor deserved the award. Afterward Judy O’Connor blew a kiss to the crowd that gave her a standing ovation. Marty O’Connor has already secured a job as the head of corporate sponsorships for a youth action sports startup called DIVERTcity. He is still working out the logistics but plans to have a professional assistant help him in his new career. Both mother and son say their graduate school journey changed their lives for the better.